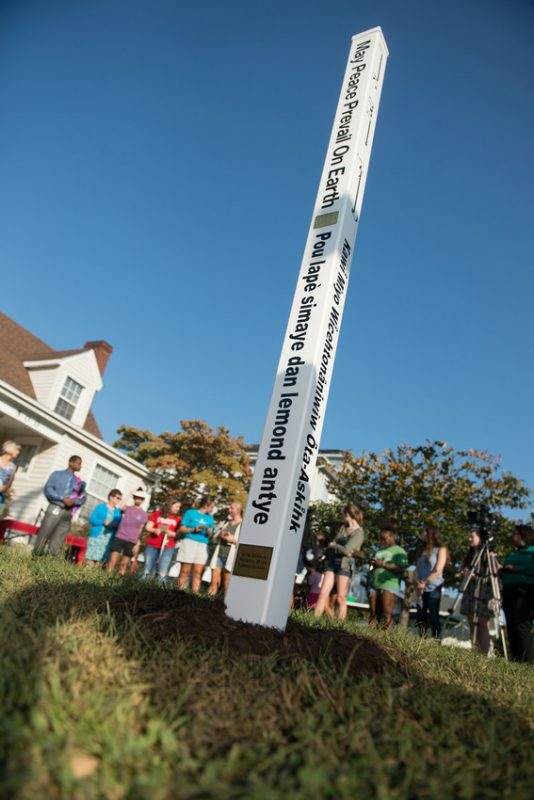 A peace pole that University of Lynchburg unveiled Thursday is a symbol of hope for peace in the future. But it also stands as a testament to the commitment and example of Anne Gibbons. The Spiritual Life Center staff planned the event as a way to surprise Gibbons and celebrate her 30th anniversary with University of Lynchburg. Gibbons, who came to University of Lynchburg as a Catholic campus minister 30 years ago, has served in numerous other roles since then, including her present role as director of the Bonner Leader program and associate chaplain. She knew the peace pole was coming — it had been planned for weeks, and she had a place in the program to make remarks — but she did not know that the peace pole was dedicated to her until the middle of the dedication ceremony. She said the peace pole joins other symbols at University of Lynchburg, such as the LC LOVE sculpture, mean to inspire people in the community to live out the values of the College. “This is a lovely pole, but it’s really meant to inspire us to actions for peace,” she said. 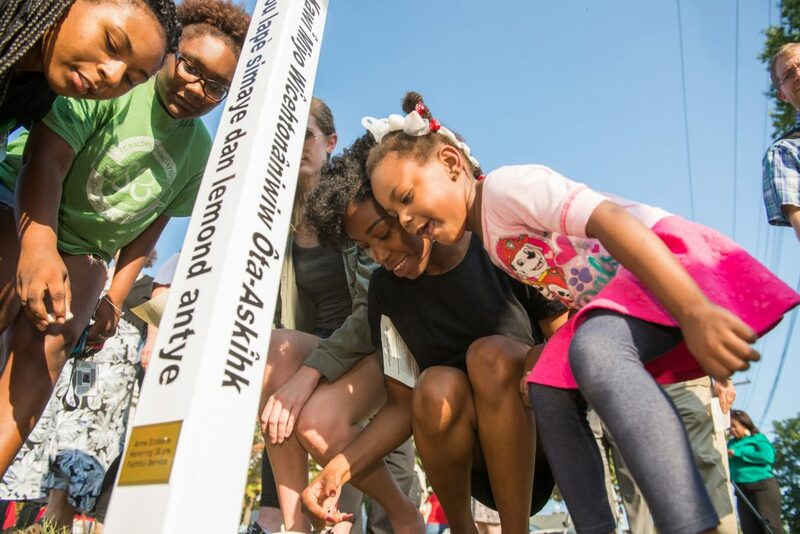 One of the languages on the peace pole, Creole, was chosen to commemorate mission trips Gibbons has taken to Haiti over the years and the annual Hike for Haiti fundraiser she organizes. The language is spoken by about 10 million people in the Caribbean nation. 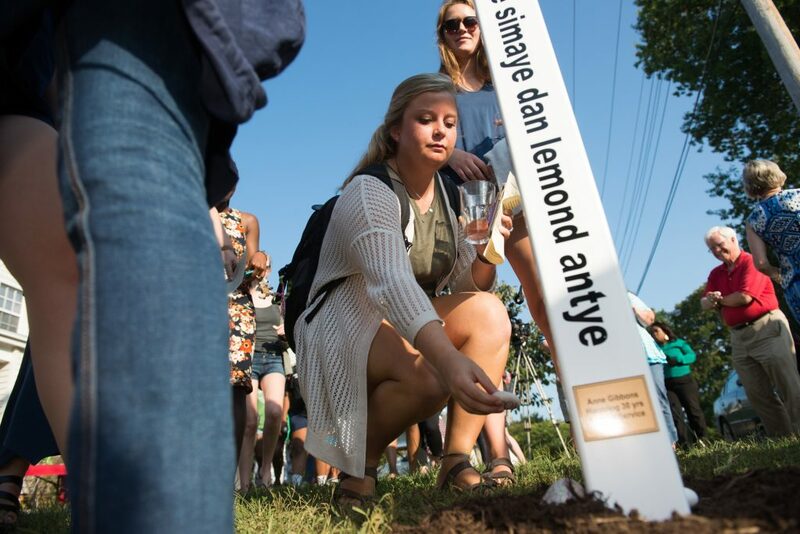 Although plans for installing the peace pole have been underway for months, Spiritual Life staff believed recent events — such as violent protests in Charlottesville, Virginia, and other locations, and the threat of conflict with North Korea — make it all the more important to raise a symbol of peace. See the story by WFXR, a Roanoke TV station.